Immigration to Canada may look like an easy process, but the amount of requirements one has to surpass in order to meet immigration officials’ needs may seem endless. Getting accepted into Canada is no easy matter and there are many things that may stand an obstacle in one’s visa application. In this blog, we will discuss what immigration factors can jeopardize one’s entry into Canada. Here at Akrami and Associates, we help numerous clients with their unique and diverse immigration matters. If you have any questions or personal immigration issues, do not hesitate to contact Akrami and Associates requesting a consultation at 416-477-2545. Book a consultation now and become a part of the team. Without further delay, let us discuss the meaning of inadmissibility, the 3 grounds of inadmissibility, and what each factor entails. Inadmissibility is a common term used by immigration officials for those who have been denied entry into Canada for a specific reason whether this be that they are seen as a threat to society, a risk to the Canadian public, or as someone unable to support themselves causing them to live off of Canadian benefits. To prevent being deemed inadmissible, it is your responsibility as a principle applicant to be aware of what is needed to enter Canada and what will cause your application to be denied. Security is a major must when it comes to immigration. The primary goal of immigration officials is to protect our Canadian society. This is the reason why all immigration applications emphasize security above all. Therefore, people who fail to meet the standards of Canada’s immigration requirements will be deemed inadmissible to Canada. Some examples of factors that could cause your visa application to be denied are evidence showing ties to espionage, violence or acts of terrorism, attempts to overthrow the government, and/or being apart of groups associated with these criminal ties. Committing a crime, that if punished, has a minimum sentence of 10 years can also be added to the list of inadmissible factors. Under security, an essential part of your application process would definitely be the police clearance certificate. This form is an official document used as a source by immigration officers, which identifies your current criminal status or that you do not have any criminal links to crimes. From this form, one’s visa application can possibility either be denied or accepted depending on the subject matter pertaining to one’s criminal background. There are many names for a police clearance certificate, depending on the province or territory, and some include good conduct certificates, or judicial record extracts. Being associated in human or international rights violations, including war crimes, crimes targeting humanity, or being a senior official in government who conducted human rights violations are all factors, related under security, to be denied entry. Any individual failing to comply with the requirements for immigration or who do not meet immigration officer standards can jeopardize and even lose their ability to enter Canada. Another reason that can impede your ability to enter Canada is for medical reasons. Medical records and examinations are done for the sole purpose of protecting Canadian society, similar to the objective of police clearances and criminal inadmissibility. Immigration officials are highly protective and strict in these matters, as they try to heavily discourage those trying to enter Canada with terminal or infectious diseases that could possibly spread and hurt the residents of Canada. If one fails their medical examination, they will be automatically declared inadmissible into Canada and their application will be rejected. Having a health condition that contributes to high demands on Canadian social and health services is another factor pertaining to the reasons why someone can be deemed inadmissible into Canada. Although there are many medical reasons to be seen as inadmissible to Canada, there are some exceptions to these factors. These include those travelling to Canada for less than 6 months and those under the family class spousal sponsorships, dependent children, common-law partner, convention refugees, or protected persons. The last major reason to be denied entry into Canada is your financial circumstances. Someone who is unable to support themselves and their family members financially cannot be allowed entry into Canada, as their dependency on others will weigh heavily. Financial support is very important in cases especially pertaining to immigration to another country, as you have to prove that you can live off your finance and survive in Canada’s growing economy. Without much money, it leaves immigration officers with only one option in deciding your admissibility to Canada. There option will result in no entry. To avoid such hardship in your applications, you can simply try to obtain a job that will allow you to receive the minimum requirement of money asked for by immigration officials. This will solve your financial admissibility and allow for a smoother visa application process. If any of these grounds relate to you, do not worry, as there is always hope for those trying to enter Canada. Certain immigration applications can actually grant you admissibility into Canada once certain requirements have been met. Please note that the information in this blog is just a reference and that we strongly advise you to contact our experienced lawyer for immigration help. If you are seen as criminally inadmissible, you can apply for criminal rehabilitation. This application is to be applied for by the applicant 5 years after the completion of the sentence. 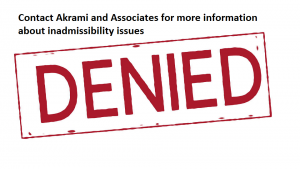 For detailed information on applications related to both financial inadmissibility and medical inadmissibility, we recommend you contact Akrami and Associates. Throughout this blog, we have reviewed the three different grounds of inadmissibility pertaining to one’s entry to Canada and what impact they can have on an individual’s application. If you have any concerns regarding your admissibility into Canada or on any related immigration matters, please do not hesitate to contact us, Akrami and Associates, at 416-477-2545 requesting a consultation with our experienced lawyer. With our team of dedicated, experiential lawyers and associates, we can help deal with your toughest immigration matters with ease, relieving one cause of stress off your shoulders. Remember, there is always a way. Please do not forget to also check out our Facebook page and visit our website at (www.thevisa.ca) for daily information on updated local Canadian immigration issues and matters.